Premio Brajnovic a la communication is a prestigious Spanish award (500,000 pesets) established in 1997 upon the initiative of newspapermen and lecturers from the University of Pamplona as a recognition to Luka Brajnović (born in 1919 in Kotor, in Boka kotorska in today's Montenegro, died in 2001). He was a professor of Ethics of the University of Navarra, a former director of the Institute of Artes Liberales, a well known Spanish intellectual. It is interesting that the award was established during his lifetime. 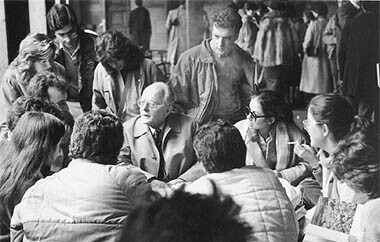 The Luka Brajnovic Award for Communication was inaugurated by the School of Communication at the University of Navarra in 1997. 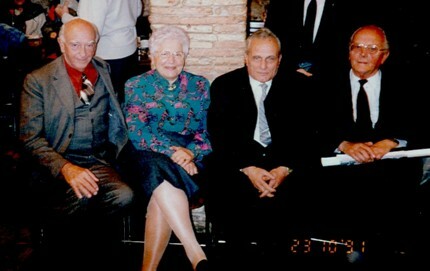 The award was established in memory of Luka Brajnovic (who died on the 8th February 2001) as a mark of respect to his career, his professional standing and reputation. 2000: Antonio Fontán, journalist and professor of journalism. 2003: José Javier Uranga, Navarre journalist. 2005: Joaquín Navarro-Valls, spokesperson for the Holy See. Starting university studies at the age of sixteen involves discovering a new sense of freedom, independence and responsibility. For me personally, going to the university, in my case, the University of Navarra, was a sea change. I was on my own for the first time, a student of journalism, full of expectation, the happiest woman in the world. Everything was as I had imagined it would be. Everything, that is, except Don Luka, the most outstanding professor in Pamplona, although he wasn´t from Pamplona. 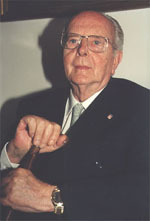 Don Luka Brajnovic was born in Croatia and had been the editor of a newspapeer. Nothing in his quiet demeanor gave away the fact that he missed his country or that he had suffered greatly. He never spoke of his inner feelings, but his daughter, Elica, was a friend of mine and one day she showed me a photograph of her little sisters and brother. When I commented on how young they were, Elica explained that she hadn´t met her father until she was thirteen: It was in 1956 at the train station in Munich where I saw him for the first time waiting for my mother and me as we stepped onto the platform. My father had escaped from Yugoslavia and had wandered around Europe and he had even been confined to a concentration camp. My mother hadn´t seen him again since I was born.ar I wasn´t able to get accustomed to the idea that that thin man was my father. Since then, Munich is the most wonderful city in the world. Afterwards, here in Spain, the family grew.
. He taught us in such a manner as to make us want to learn, not just to pass examinations. That passing an examination was a momentary victory, but learning in itself was for a lifetime. That no one should feel ashamed of a failing grade. Incredible as it may seem, I discovered that there were any number of historically significant men and women, including some Nobel Prize winners, who had received failing grades. Ramon y Cajal had failed Logic and Psychology; Ramon del Valle-Inclan was hopeless in Latin; Castellano in Arithmetic, Algebra and International Law; Garcia Lorca failed Spanish Language five times; Azorín, General Literature and Spanish Literature; Ramon de la Serna, Literature; Pio Baroja, three failing grades in Pathology and Spanish Poetry; Machado, Eduardo Marquina and Ramon Jimenez failed in Critical History of Spain.
. He was always Don Luka, perhaps because we never spoke informally to our professors, or maybe because he was simply a great man. Goodbye Don Luka.